“Debbie Barbiero is a great nutritionist, life coach, and chef. She has taught me so much about food and cooking, which is just as much fun as it is educational. Debbie also is helping me gain weight, which is why I started using her as a nutritionist. She has been a great help with that, along with getting me to try new foods and recipes. We make fun, healthy recipes together, from salads to brownies, even breakfast foods like granola. Debbie is a great help for other problems that aren’t necessarily health or nutritional related, such as accomplishing goals. I especially enjoy getting to experiment with herbs and spices. Her services also include meals-to-go, group classes, parties, classes for children, and personal chef. She is an excellent nutritionist, and has become a great friend to me too.” Gina, 22 year old young woman battling Anorexia. When we started our journey together she weighed 74.6 lbs and currently weighs 94.6 lbs. I hired Debra for a birthday event for my mom Josephine. She was Fabulous. Four of us watched and learned and participated, chatted about food and preparation. I was not exactly sure what to expect, but I was impressed. The food was excellent, pretty and tasty, we learned, we laughed and had a great time! Took lots of pics too, this was a great memory and activity for my moms birthday. SHE EVEN CLEANED THE DISHES AFTER! came in a BEautiul professional red chefs coat, We plan on making the risotto for the first time ourselves this weekend- very excited. “Debbie cooked an amazing meal for my husband and my first wedding anniversary. She came to the house well prepared and cooked and served a delicious and health conscious 4 course meal. Having her come to our home and prepare a special meal for our special occasion was nothing shy of amazing and made the night a lot more l memorable then it would of been if we went out to dinner. I would highly recommend Debbie for any occasion!” Tiffany M.
I have known Debbie for about 13 years. She is a great person inside and out. I feel she has met her calling in life to become a life coach. She really encourages people to reach their goals in all aspects of life not just with food, but family, work-life, etc. She helps you balance between all of the aspects and demands of your life. Debbie offers a variety of programs to suit your needs. She helps you find how simple changes in your life can be better for you health wise and avoid unnessary medications. Debbie is very knowledgeable and has really taught me things you would never know. What is truly great about her program is it is designed for you not a program that everyone follows. Everyone is different and she will work with you to find what is the most beneficial for your body. She also offers programs where she will cook for you to meet your dietary needs whether it is during one of her sessions and you can even order food to go! Everything I have tried I have loved – easy simple recipes that are healthy and make a difference! If you are looking for a new and rewarding program – Debbie is the answer. A Testimonial After Just 3 Sessions! “Dear Debbie, It was such a pleasure and so helpful to work with you as my nutrition/health coach this summer. I’ve always had questions about how the food I eat affects me, how my metabolism has changed in the last 5-10 years, and what were the best steps to get me started on a new path to lose weight permanently and feel better physically. I’ve had joint pain for years. When I heard that you could handle such conditions as Lupus and Hashimoto’s Disease for you and your daughter, I knew you were the one to come to. You’ve answered all my questions and more. I now have a really usable list of foods that are good for me as well as a list of foods to avoid (and boy do I notice when/if I eat some of the wrong foods!) I’m really more in tune to eating healthy and it’s more than just “I should”, it’s become a new mindset for me for life. Thanks for helping me make this huge transition. I’m down 15 pounds already and my joints feel better, my energy is up, and I’m really committed to staying with this for the long haul. I have and will continue to recommend you to others. It was fun to take this journey with my sister. Now we have all new things to talk about! I battle Lyme Disease and thyroid issues. I was looking for someone that could help me improve my health and boost my immune system. I found Debbie by seeing her advertisement on her car and checked out her website and sent her an email. I signed up for the Premium Program. She makes me a delicious meal tailored to my food preferences and an hour of information on healthy eating. I have learned alot from Debbie and have a folder full of healthy recipes to make to get my immune system strong and to lose a few pounds. I would recommend Debbie to anyone. For people just wanting to lose a few pounds or a lot of weight or to just wanting to learn how to live a healthier lifestyle. She has alot of information to give. Debbie is a warm, gentle, and supportive coach. During our sessions, she helped guide me through my own fears of not being enough by identifying my unique gifts and strengths. I truly appreciated her genuine kindness and interest in helping me grow to become a successful and confident coach. I want to thank you for all your help in being my life coach it was a great experience. Well, for starters I calculate that I lost about 28 lbs and I am in the process of revamping my wardrobe, now most of my pants are simply too big for me. Actually to think of it , that’s not a bad feeling. Well, I have seen all the changes and intelligent choices I have made and I see and feel the results. I pretty much eliminated a lot of my bad food choices and had focused on eating what is healthy. I guess the 28 pound loss is testimony to that . In addition I feel and have so much more energy and and-overall positive attitude. I also found under your guidance I have began eating smaller more nutritional meals and have begun to also eat a variety of different foods that previously I would never have tried. Well again Debbie I want to thank you for all your help and I look forward to losing more weight and enjoying a more energetic and healthy life style. PS. I also found out that by eating more nutritious food I am not as hungry as often. And that is a good thing! 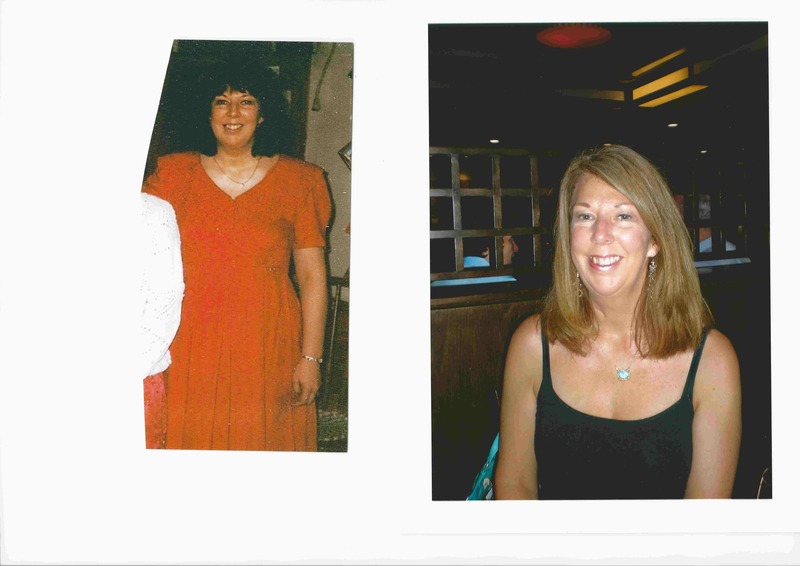 Before and After– I lost over 60 lbs and am off all medication for Hashimoto’s disease and cholesterol. I am completely med free! “I came to Debbie at an upside-down time in my life. I was emotionally drained and struggling with an increasing waistline which dragged me down even more. I felt I needed something more than a “diet”. Debbie has inspired me and uplifted me after each session. The nutritious homemade food she makes is delightful and our session is like having a cup of tea with an old friend. Debbie has helped me achieve balance in my life and recently inspired me to give Yoga a try. Through her inspiration and joy of life I have now been able to get back on track with my weight-loss by using all the healthy lifestyle suggestions she has shared and taught me. One of the nutritious foods she has introduced me to is quinos, which is delicious, and now appears weekly on “my healthy plate”. I plan on continuing into the next phase of her integrative nutrition program and look forward to a healthy future. Thank you Debbie”. “I met Debbie at Weight Watchers. She was my instructor and the most uplifting, upbeat and very motivating speakers I have ever met. She drew many people in week after week. I did lose weight on this program but because of my hypo-thyroid, I struggled with keeping it off as well as staying energized. Over the years I tried numerous diets lost some weight only to gain it back again. I felt deprived most of the time. I admit, I absolutely love to eat! I battled hypothyroid and Hashimoto’s disease, an auto-immune disease which left me exhausted, pain on the sides of my face into the back of my head, brain fog, heart palpitations, pain in several parts of my body, insomnia,thickness in my throat, hair loss, irritability and a few other symptoms. My cholesterol was 295! I knew I needed to do something and did not want to rely on medicine. I enrolled in the Institute for Integrative Nutrition which is the largest school of Nutrition in the world! Every day has been filled with amazing learning which I have learned to incorporate into my life. I have lost over 60 pounds without feeling like I am dieting. I am no longer on any medication for my thyroid or anything else. I have more energy and I feel better than I did 30 years ago. I get full blood work done every 6 months to make sure everything is in balance. My endocrinologist is very pleased with my progress and good health that she refers diabetes and thyroid patients to me for health coaching. I would love to have the opportunity to help you regain your health too. Knowledge is power. The best medicine is what you put on your fork. “I enjoyed Debbie as a Weight Watchers Leader, which is how I got to know her. But that is just the tip of the iceberg! She is a warm personable, knowledgeable Health Coach who has the ability to motivate you, cheer you on and be a wonderful example of healthy living to follow. She gently leads you in a more healthful direction. Sitting and chatting with Debbie is like a big hug for your soul! She keeps things very upbeat and encourages you as you move along on your journey.